A tiptronic is a type of transmission that allows you to choose between manual and automatic shifting. Tiptronic vehicles usually come with a switch on the steering wheel or gear shifter that displays a “plus” or “minus” sign. Plus is for shifting upward and minus is for downshifting. Unlike manual transmissions, a tiptronic vehicle doesn’t require a clutch to use, which is a huge positive in many driver’s eyes. Learning to operate the clutch is generally considered one of the more annoying parts of driving a vehicle with a manual transmission. Start your ignition while pressing firmly on the brake pedal. Begin to accelerate just like you would in a regular car. Depending on the type of tiptronic gearbox in your car, it may shift through the first two gears for you. From there, you can move the switch onto manual-shifting mode and continue to shift upward as you drive. If you’re switch is on the steering wheel, press the plus button to shift upwards. You don’t need to reduce the throttle like you would in a regular manual transmission. A tiptronic transmission does most of the work for you. 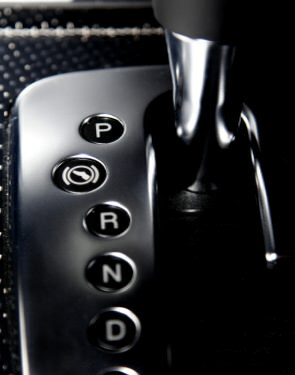 When it comes time to downshift, press the minus button or pull the gear shifter down a level. Always remember to drive carefully by downshifting before you arrive at a corner. If you realize halfway through the turn that you’re going too fast and attempt to downshift, it could cause you to lose control. If you need to back up, switch back to automatic mode and reverse as you normally would. Keep in mind that your car will likely switch back into automatic mode if you don’t shift gears for a certain amount of time. Most tiptronic engines do this automatically for the purpose of safety and convenience. If you’re getting ready to purchase a car, you may be wondering if you should go for an automatic, tiptronic or manual transmission. There are positives and negatives to each type, so what you choose should be determined by your own individual needs. Many drivers believe that a simple manual transmission is best, but this would require that you learn to operate a clutch, something you may not feel comfortable doing. An automatic transmission is perhaps the easiest to use, but it doesn’t give you the freedom to shift between gears on your own, which makes many drivers feel less connected to the car. A tiptronic engine gives you the choice of how you operate your car, but it may be heavier than a manual transmission, and this could sacrifice a bit of your horsepower. Much like regular cars, tiptronic vehicles need regular maintenance to continue operating properly. Aside from oil changes, tire rotations and other basic maintenance work, you will want to get regular transmission flushes for your tiptronic engine. This can be done at any quality mechanic shop for a reasonable price. Always visit a mechanic right away if you notice leaking transmission fluid or are having trouble shifting. Transmission problems can be extremely expensive if they aren’t caught early enough. Ultimately, the type of transmission you choose is a matter of personal preference. A tiptronic transmission doesn’t have much to offer when it comes to performance, but it could prove to be a good decision if you want a bit more freedom over how you operate your car.